Oceanfront oasis located in historical Annapolis Royal. Property 2: Oceanfront oasis located in historical Annapolis Royal. Granville House, perfect location, perfect house! Property 3: Granville House, perfect location, perfect house! Come Stay in Historic Downtown Annapolis Royal! Property 6: Come Stay in Historic Downtown Annapolis Royal! Property 7: Utopia, A Place To Enjoy And Relax, In A Beautiful Home. Property 14: Boutique Farmhouse Cottage; 60 acres; Annapolis Royal 5 min. 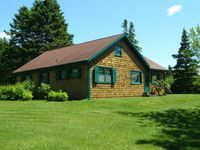 Property 15: RENOVATED 1831 FUNDY VIEW FARM,Sleeps 2 t0 8. C$129. for 2. .Pet friendly. Property 29: Nova Scotia Charm!!! Property 30: EXPECT THE VERY BEST The Fisher House, Unique Three Bedroom Home, 4 night min. Sal is very welcoming and helpful with anything you might need. He knows a lot about the area and highlighted attractions to see in the short time we had. Excellent breakfasts and enjoyed our conversations around the table--both entertaining and enlightening! Thanks Sal!